The State Council has been publishing several opinions over the past few years in order to guide China’s efforts to become an innovative economy. These include an opinion on cloud computing (Feb. 2015), structural reform to encourage innovation, innovation and entrepreneurship education (May 2015), on and on “Internet Plus” (July 2015), amongst other areas. Now, in 32 articles, the State Council has published its “Opinion of the State Council on Accelerating the Building of a Strong Intellectual Property Nation under New Conditions” (promulgated Dec. 22, 2015) (国务院关于新形势下加快 知识产权强国建设的若干意见, 国发〔2015〕71号) (the “Opinion”). The wordcloud of the Opinion, posted above gives us some idea its themes. The Opinion furthers the goals of the National IP Strategy, and promises, by 2020, to achieve “decisive results” in important intellectual property reforms. Its six broad topics include: reforming the IP management system, implementing strict protection of IP, promoting IP creation and utilization, strengthening planning for key industries in their overseas profile and controlling risks, improving the level of international IP cooperation, and strengthening organizing implementation and policy guarantees. However, this summary does not do justice to some of the interesting policy questions it poses that are suggested by a close reading of the text. Trade Secrets – A New Law or A Reform to the Antiunfair Competition Law? : The Opinion notes that China plans to “promote completion of trade secret law and regulations, increase trade secret protection in talent migration and technology cooperation.” Oddly, the Opinion doesn’t discuss reforming China’s Antiunfair Competition Law, but appears to favor a stand alone trade secret law. Is accession to UPOV ’91 Not in the Works? Is new legislation on designs possible? : The Opinion notes that China will “perfect new plant varieties and genetic resources and related traditional knowledge, database protection, and national defense intellectual property related legal systems. Geographical indications will be legislated in due course. Research to improve the intellectual property protection system business model and the applied art design patent protection system.” The lack of reference to accession to UPOV ’91 (for plant variety protection) is concerning, as other parts of the Opinion reference accession to the Hague and Marrakesh treaties (for industrial designs and copyright exceptions, respectively). Changes in the Tax Law to More Directly Subsidize R&D? : The Opinion notes that China will “implement a research and development expenses tax deduction policy.” Does this suggest that other programs, such as the tax deduction afforded for High and New Technology Enterprises will be phased out? The Opinion also notes that strategies are also being developed to reduce patent application fees and maintenance costs. Promoting China’s Technology Exports, but No Focus on Improving the Environment for Technology Imports: The Opinion also separately talks about promoting IP licensing overseas, including supporting model contracts and guidelines, but makes no mention on how to improve the environment for imported technology, which has been the focus of several recent engagements. Promoting the Development of IP Intensive Industries, Including Preferential Procurement Policies? : The Opinions notes that China will accelerate support for government procurement programs for products from IP intensive industries. This language could raise concerns about discriminatory government procurement programs, although there is no detail. Improving Punitive Damages, Judicial Protection, and International Criminal Justice Cooperation: The Opinion underscores a continued commitment to increasing damages, underscoring the “leading role” of the courts in IP protection and calls for increased international criminal justice cooperation. Could this be read to suggest that the State Council is not in favor of increased administrative enforcement for patents, as is currently being proposed in the patent law reform? Improving IP Prosecution Systems: The Opinion calls for continued improvements in electronic filing including support for patent prosecution highway programs. Improving Regulations for IP Abuse, and Addressing the Challenges of F/RAND Licensing – But Also to Include Consideration for Handling Infringement? The Opinion calls for improving the regulation of IP abuse and the development of enforcement guidelines. It also calls for improving the licensing policy for Standards Essential Patents, and “practical rules for stopping infringement.” 完善标准必要专利的公平、合理、无歧视许可政策和停止侵权适用规则。 These practical rules will presumably address the controversial issue of the availability of injunctions for patents encumbered by F/RAND licensing obligations. However, the recognition that the failure of a prospective licensee to take a license could constitute infringement, rather than an abuse of injunctive relief as was suggested by NDRC in its draft IPR abuse guidelines and suggests that a more holistic approach could be in the works. This is an important policy-oriented document that encompassing a wide range of domestic and global IP issues. Does the omission or inclusion of individual terms suggest as much as I have inferred in this blog? Only time will tell. Until we know more, I welcome readers’ feedback and impressions. Back in 2012, I noted that “[t]he Chinese civil judiciary is pursuing reform and gaining experience, as Deng Xiaoping noted, by crossing the river by feeling the stones. A disproportionate part of that judicial experience is also being gained from the relatively small numbers of IP cases in the Chinese courts.” One notable and welcome source of those reforms is the new Beijing IP court, which is also serving as a base for experimenting in the development of a system of case law with Chinese characteristics. I believe that the most notable development in Chinese IP in 2015 has been the role the courts are playing in judicial reform generally. I have been privileged to hear Chief Judge Su Chi and his team from this court speak several times since his court was established, and have never failed to be impressed by their depth of knowledge and passion for judging. The other case, no less dramatic, involves what may be the publication of a dissenting period. Both of these developments occurred this month (December 2015). The case arising under Article 21 of the SPC Interpretation involved an interpretation of the State Administration of Industry and Commerce regarding what constitutes a “day” for purposes of implementing a change in trademark classifications. The IP Court found that the notice’s definition of a “day from a 24 hour period to a month exceeded the scope of power to explain the law, ruling in favor of plaintiff who claimed to have filed its trademark in advance of two other parties who filed one week and three weeks after plaintiffs filing. When this case was heard in September, Chinese media talked about this as the first effort to “break the ice” by a Chinese court to invalidate administrative “红头文件” – red letterhead documents, i.e., normative documents of the type referenced in the JI. The court reportedly also experimented in using live testimony and cross-examination in an atypical debate-style process. The pleadings were also entered into as part of the opinion after the party’s signatures confirmation. The decision does not yet appear to be on line, but a summary is attached here (in Chinese). Another procedurally significant decision involved the appearance of dissenting opinions in IP cases. Here again, the Beijing IP court is a trail and trial blazer in this recent experiment. The case involved Ernest Borel (Far East) Co. Ltd. and China’s Trademark Review and Adjudication Board. 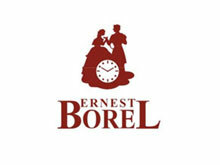 There were different opinions by the court on proof of copyright in the logo of Ernest Borel, including use of the original trademark registration and a subsequent copyright registration to prove that the design belonged to Ernest Borel. The minority opinion supported using these two registrations as a proof of copyright ownership. Ernest Borel was attempting to prove that it owned the copyright in a logo that was being used by a Shenzhen company in its trademark registration (深圳市依波路保健科技有限公司). Two notable experiments by an experimental court! Note that the logo at the top of this article is a logo of Ernest Borel that I found online if for illustrative purposes only. It does not imply any endorsement of the positions here by Ernest Borel. It may not also be the trademark that is the subject of the pending case. Any trademarks and copyrights are the property of their respective owners.